SACCO AND VANZETTI (director: Peter Miller, 2006) is an 80-minute-long documentary that tells the story of Nicola Sacco and Bartolomeo Vanzetti, two Italian immigrant anarchists who were accused of a murder in 1920, and executed in Boston in 1927 after a notoriously prejudiced trial. It is the first major documentary film about this landmark story. 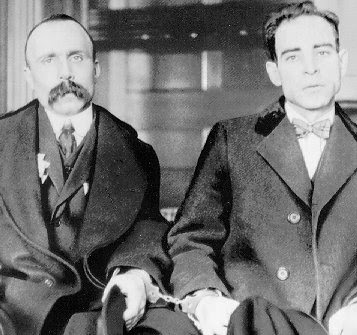 The ordeal of Sacco and Vanzetti came to symbolize the bigotry and intolerance directed at immigrants and dissenters in America, and millions of people in the U.S. and around the world protested on their behalf. Nearly eighty years later, the story continues to have great resonance, as America once again grapples with issues of civil liberties and the rights of immigrants. SACCO AND VANZETTI brings to life the personal, political, and legal aspects of this heartbreaking story. The powerful prison writings of Sacco and Vanzetti are read by actors John Turturro and Tony Shalhoub. A chorus of passionate commentators propels the narrative, including Howard Zinn, Studs Terkel, Arlo Guthrie, and a number of older people with personal connections to the story. Artwork, music, poetry, and feature film clips about the case are interwoven into the storytelling. Through the tragic story of Sacco and Vanzetti, and the inspiring images of those who keep their memories alive, audiences will experience a universal – and very timely – tale of official injustice and human resilience. URBAN WASTELAND LOCATION: beneath the Soquel Avenue bridge, at Riverside Drive (if you bring a car, please park on Riverside Drive and not in the resturant parking lot, thanks).